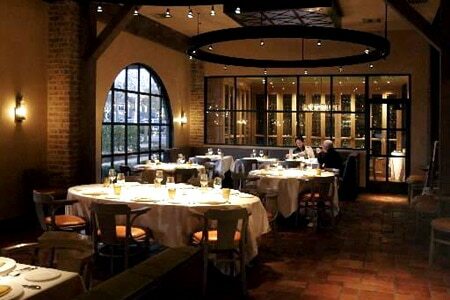 Chiarello’s three R’s: rich, rustic, refined dining. : Michael Chiarello’s Yountville compound aligns with expectations of something big from a celebrity chef marking sacred culinary territory. His style of comfortable elegance begins on the ample porch lounge equipped with stone fireplaces and couches. Inside, brick walls, coffee colored plank flooring and high ceilings with exposed beams feel masculine and solid, yet disarmed by intriguing contrasts: a pair of hefty Murano glass chandeliers, raw stoneware, copper water goblets and decanter-style lamps dangling above an open kitchen that spans the vast dining room. Hearty indulgence defines this brand of Italian cuisine. Cases in point: the pecorino cheese flan starter with soft boiled egg in a deep fried casing, top lopped off, and upright in a nest of oven roasted rapini, or cold fennel poached lobster with fresh burrata, wild mushrooms and fried arugula. Such plush, over-the-top combinations sometimes feel superfluous since the separate, decidedly tasty elements almost compete with one another. Pasta should be compulsory here; it’s house-made including the garganelli, tubes formed by rolling flat squares into diagonals, then strewing them with braised rabbit shreds and house ricotta for a layering of earthy flavors. Hefty entrées include rib-eye with vigorous shallot jus and truffle-Parmesan frites, or oven-roasted whole barramundi, pre-boned and stuffed with lemon. The 18-minute, time-to-digest, molten chocolate cake may be the only feasible way to make room for dessert. Wine selections traverse California and Italy.